in News. 7 May 2010. 200 views. Independent tyre specialist Bear’s Tyres has developed a software-based tyre tracker to ensure operators gain maximum lifespan from every tyre across their entire fleet. The simple-to-use system, which logs distances and advises rotations and retreading at optimised moments of each tyre’s lifespan, has been developed in-house by the company for national use. 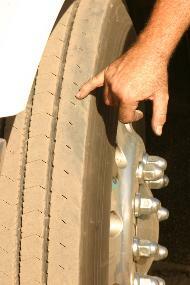 Apart from enhancing tyre life, the technology also delivers accurate cost breakdowns for each tyre. According to Brad Bearman of Bear’s Tyres, Bear’s Tyre Tracker should be seen to be as important as engine servicing and brake checks for the transport industry. “It’s not the cost of the tyres, it’s what you can get out of them that really matters,” he points out. And regardless of the brand of tyre you are using, Bearman says that managing your tyres is good for the environment, safety and your bottom line. “When we use the Bear’s Tyre Tracker,” he says, “we find that we can actually gauge the cost per kilometre of each individual … tyre on every single vehicle a company runs. In real terms, Bearman says, “we can increase your tyre life by anywhere between 25 to 50 percent; and from a capital expenditure point of view, spending only $25,000 a year on tyres when prior to using the tracker, you would have spent $40,000 is certainly worth thinking about”. “Just by doing something simple like managing your tyre service, using the tyre tracker to regulate your tyre rotation, keeping a form eye on your pressures and of course knowing when to retread, means that a cheapish tyre could well last you the same as a well-known name brand.